Picking up where his bestselling memoir left off-having been saved by emergency surgery after nearly dying on a mountaintop in Chile-Alda finds himself not only glad to be alive but searching for a way to squeeze the most juice out of his new life. Looking for a sense of meaning that would make this extra time count, he listens in on things he's heard himself saying in private and in public at critical points in his life-from the turbulence of the sixties, to his first Broadway show, to the birth of his children, to the ache of September 11, and beyond. Reflecting on the transitions in his life and in all our lives, he notices that "doorways are where the truth is told," and wonders if there's one thing-art, activism, family, money, fame-that could lead to a "life of meaning." In a book that is candid, wise, and as questioning as it is incisive, Alda amuses and moves us with his unique and hilarious meditations on questions great and small. 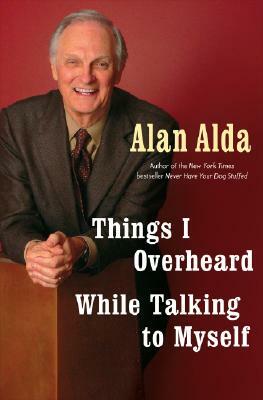 "Things I Overheard While Talking to Myself "is another superb Alan Alda performance, as inspiring and entertaining as the man himself. Description: Very Good Condition. Binding tight, pages clean. Small dent at tail of spine. Dust Jacket lightly wrinkled at edges. Nice copy!